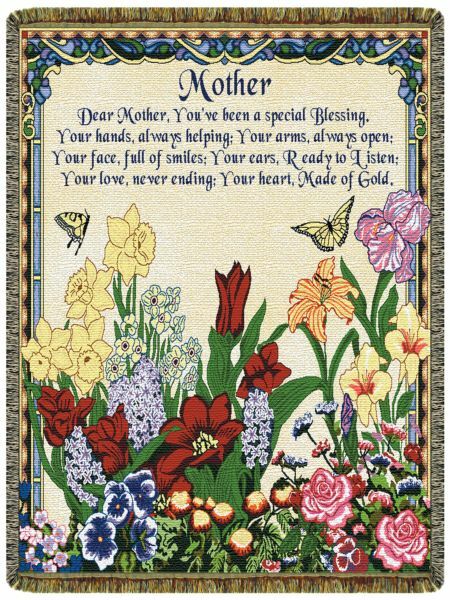 This is a beautiful tapestry throw that any mom or special ”like mom”, aunt, and grandmother will love! It’s framed with the look of stained glass, and it is filled with colorful flowers, and it reads: ”Dear Mother, you’ve been a special Blessing. Your hands, always helping; Your arms, always open; Your face, full of smiles; Your ears, Ready to Listen; Your love, never ending; Your heart, Made of Gold.” 100% Cotton Tapestry Throw Blanket. Measures Approx. 52”x68”. Made in the USA. Machine Wash in Cold Water. Cool Dry.